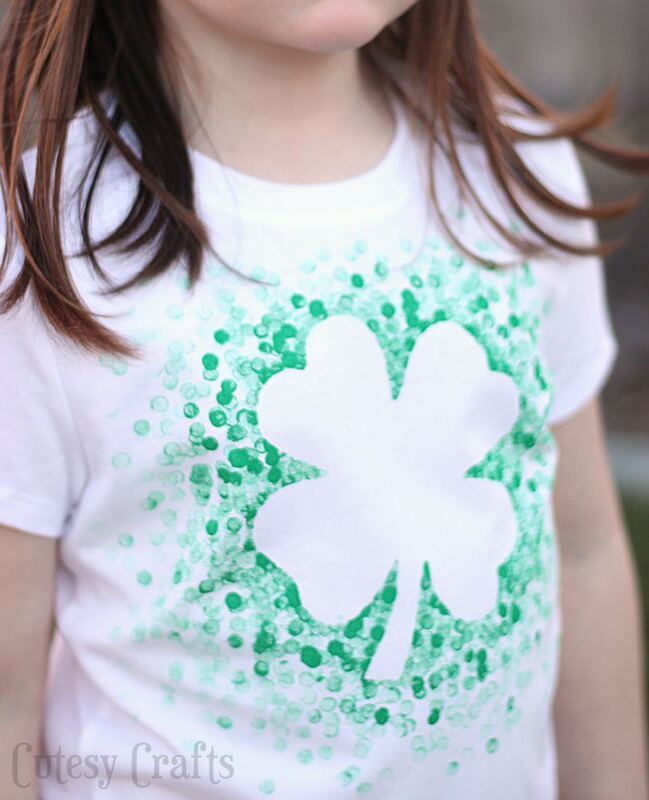 Last year I made these really cute St. Patrick’s Day shirts that I stenciled with vinyl. I’m sad that the kids grew out of them. This year, I did something different and used freezer paper. 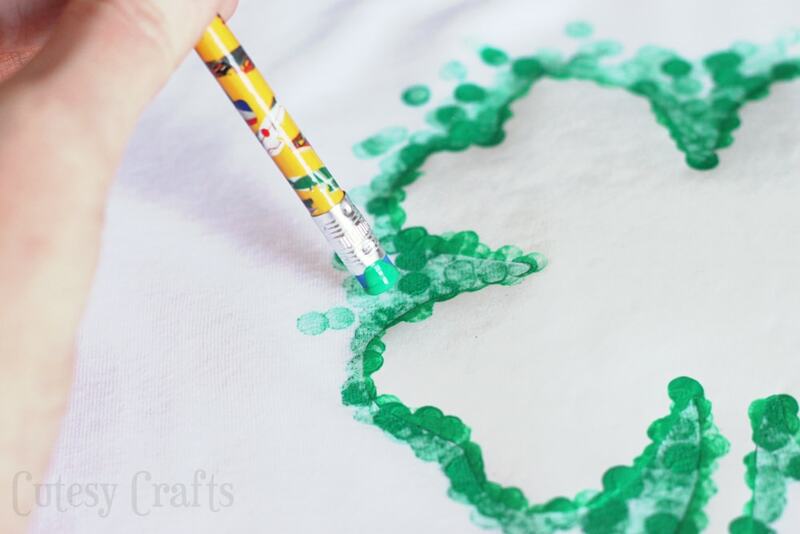 If you’ve never done freezer paper stenciling, you are in for a treat! No fancy cutting machines or vinyl required. 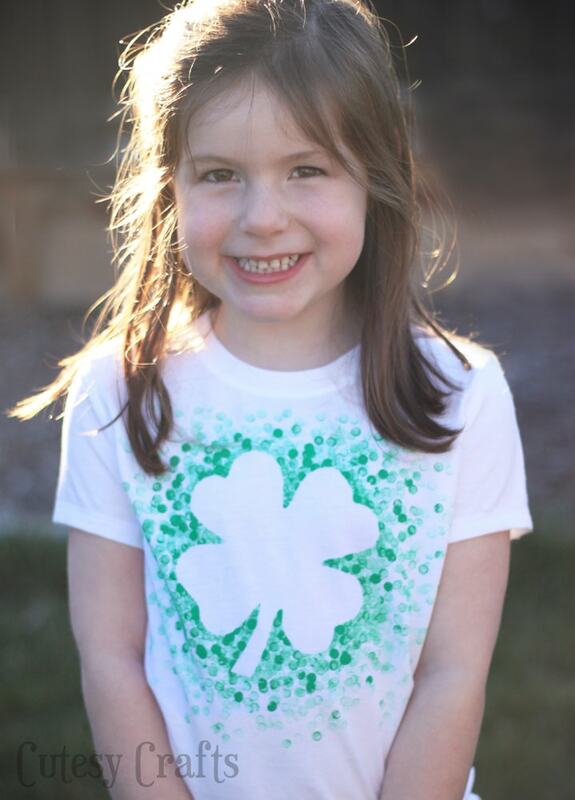 And I’m especially loving Audrey’s DIY St. Patrick’s Day shirt this year because I got to try out pencil eraser stamping! I even made a video to show you the process. You can find that below. Also click here to take a look at these marble painted shirts! 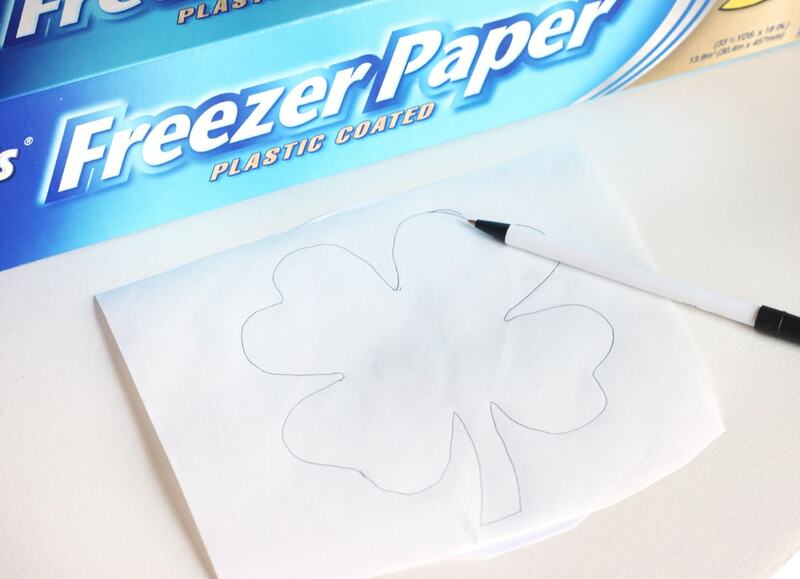 – pencil with an unused eraserLet’s get started!Trace the clover shape on the NON-shiny side of a piece of freezer paper. 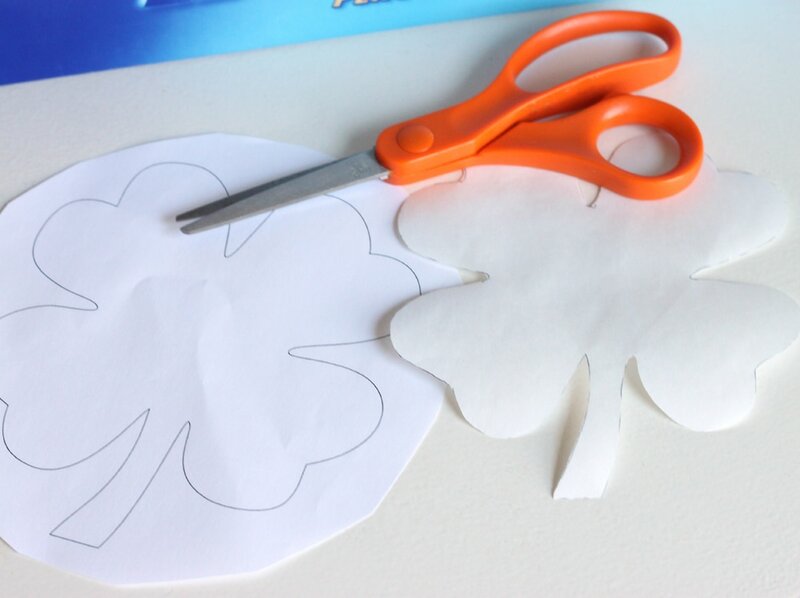 Cut out the clover shape. If you were doing a more intricate design, you could use an X-Acto knife, but scissors worked fine here. Put the clover, shiny side down, on your shirt. 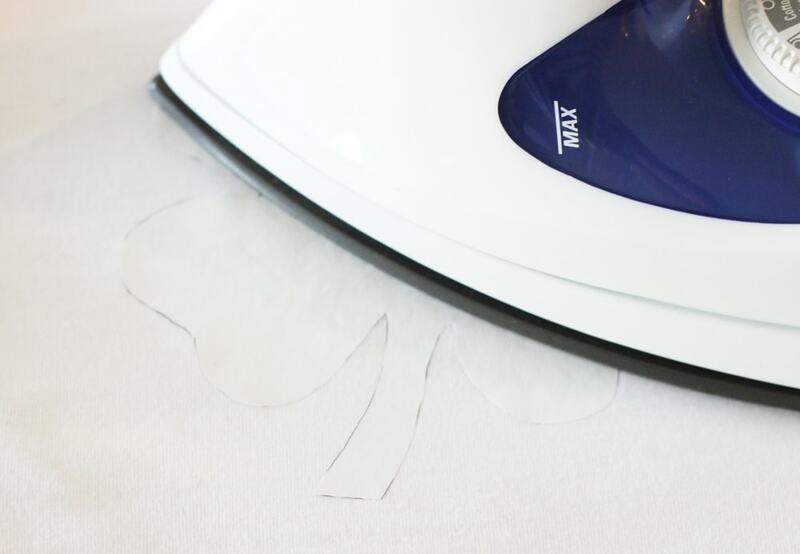 Iron it on. Steal a pencil from your son (ssshhhh…. he has so many, he won’t notice). 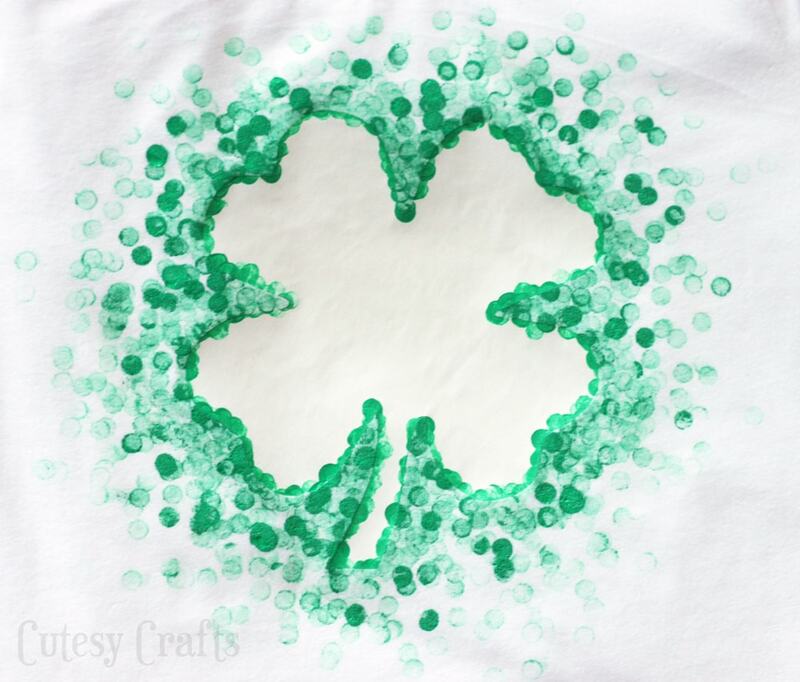 Dip the eraser in green paint and start stamping around the clover. Make sure to put another piece of freezer paper inside the shirt to keep the paint from leaking through. I put the dots closer together around the clover and then gradually faded them out. Let the paint dry and peel off the freezer paper. Follow the instructions on your paint to heat set it (usually this involves ironing or throwing it in the dryer). There you go! Cute and simple! 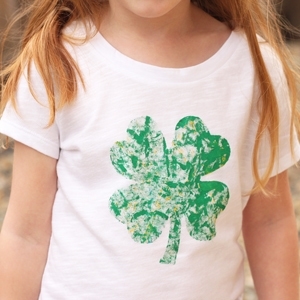 You’ve got a fun DIY St. Patrick’s Day shirt. Here’s a video to show you the process. You can watch it below or on my YouTube channel here. 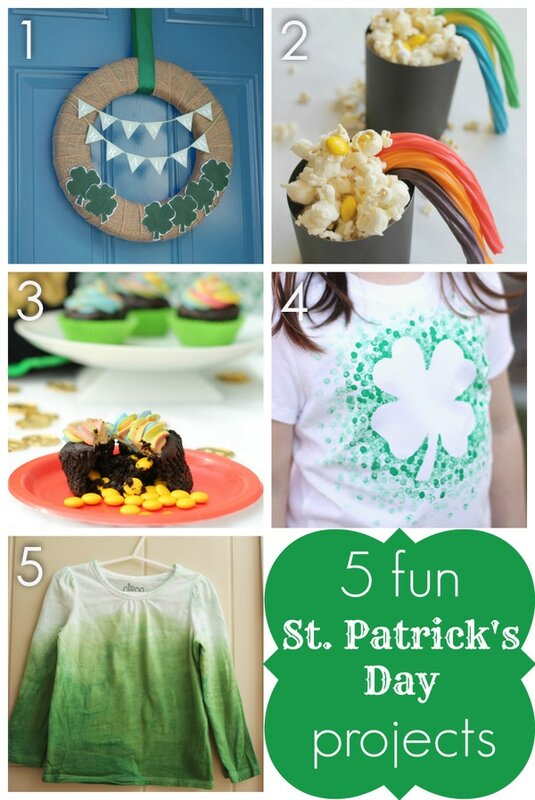 And make sure you check out these other great St. Patrick’s Day projects from some of my favorite bloggers! I’m seriously loving these! Thanks Brook! It was so easy! I’ve never done freezer paper stamping but I love this, definitely have to try it out! Oh, you’ve got to try it Britni! It’s so great! So cute! I would have never guessed that you used a pencil eraser, love it! Aw, so sweet! Your daughter looks so much like you 🙂 And great idea for a simple shirt – something that really anyone can do (including me, haha)! Thanks for sharing! Thanks Meredith! She’s my mini-me for sure! Oh my gosh this is adorable!! Definitely pinning for future reference. Thanks for sharing! Oh my goodness! So cute! 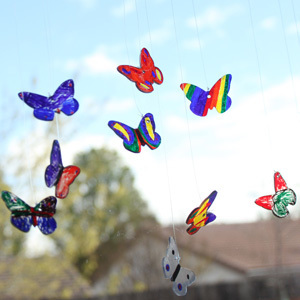 I wish I had a little lady to make one of these for! Thanks SO much for linking up to Hit Me With Your Best Shot! This is one of my knockouts! Hope to see you again soon! 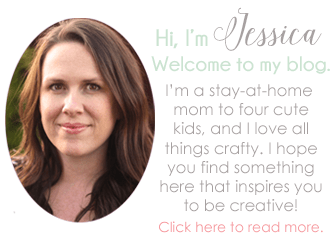 So cute Jessica, I can’t wait to try this! I love the way you faded out the dots! I am running in the Shamrock Shuffle and are going to make these for my friend and myself to wear! Thanks for the cutest idea! 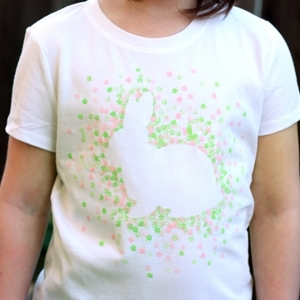 We had a snow day here and my girls made their own clover tshirts. They turned out so cute! What a fun idea! Any fabric paint will work. I used Tulip soft matte fabric paint for this. Thank you! My scouts loved doing this. We did a butterfly pattern. Now they have a shirt to wear when we all go places together. 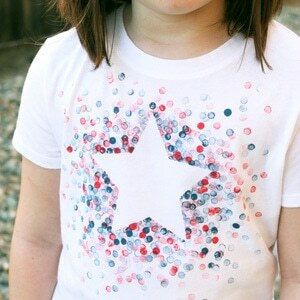 Love the idea can you tell me an estimation of the size of templates you use for the kids shirt. Thanks! I’m not sure, but there is a link to download my template for free. You should be able to measure it from there if you wanted to make a different shape.